The Pentax Optio W80 is a new do-it-all, take-everywhere compact camera that can be submerged in up to 5 meters of water, dropped from a height of 1 meter, and used in temperatures as cold as -10°C. Pentax’s most water-, shock-, dust- and cold-proof digital camera, the 12 megapixel W80 also impresses on the camera side, with a 5x zoom lens offering a focal range of 28-140mm, HD movie shooting at 1280x720 pixels at 30 frames per second, 2.5 inch LCD screen with anti-reflective coating, 1cm super macro mode, and triple anti-shake protection to help avoid unwanted camera shake. Available in Cardinal Red, Azure Blue, Honey Yellow and Gunmetal Gray, the Pentax Optio W80 costs £269.99 / $299.95. The Pentax Optio W80 is a very well-made, compact digital camera, with a pleasing-to-the-eye two-tone silver and gunmetal grey plastic body and excellent overall finish. Thick black plastic strips on each corner help reinforce the rugged appearance of the W80 and presumably play a part in the camera's shockproof-ness. It's easily small enough to fit into the palm of your hand, measuring just 99.5(W) x 56(H) x24.5(D) mm. The Pentax Optio W80 features an internal non-extending 5x optical zoom lens that's equivalent to a focal length of 28-140mm in 35mm terms, offering both a useful wide-angle focal length for landscapes and a longer telephoto length ideal for head and shoulder portraits. The maximum aperture is a fairly quick f/3.5 at the wide end, but a much slower f/5.5 at the other extreme of the zoom range. The W80 is slim for this class of camera, making it well suited to either a trouser or shirt pocket or handbag, and it weighs just 135g without the battery or memory card fitted. Despite its mostly plastic construction, the W80 is one of the better models around in terms of build quality. The overall finish is very good, looking and feeling more expensive than its modest price-tag might suggest. The only minor criticisms are the rather small handgrip on the front which can only be gripped with two fingers, making the camera more difficult to hold than it really should be, and the tripod mount which is inconveniently located in the far right corner of the bottom of the camera. Although we can't entirely vouch for the W80's ability to survive extreme environments, it did handle our rather rudimentary tests with aplomb. Submerging it in a bath full of cold water, dropping it from a meter high onto a hard surface, and storing it in the freezer compartment for a couple of hours all failed to ruffle its feathers. We also didn't notice any unwanted dust in our pictures, not that this is usually a problem for compact cameras with non-interchangeable lenses. All in all we're confident that the Pentax W80 would handle most things that you can literally throw at it, or throw it into. The Pentax Optio W80 has relatively few external controls, just 9 in total, which reflects the fact that this is a simple camera in functionality terms, with very limited photographic control on offer. All the controls are clearly labeled using industry-standard symbols and terminology, with just a couple of Pentax-specific buttons that require a quick read of the manual. Located on top of the W80 are the On / Off button and the Shutter button. On the bottom are the tripod mount and the battery compartment , which also houses the SD memory card slot. and the PC / AV Out port. The latter accepts both the USB interface cable required to connect the camera to a printer or computer and the AV cable. On the rear of the W80 is the 2.5 inch LCD screen, with a number of controls to the right, including a traditional navigation pad. You can directly access the various flash options by clicking left on the navigation pad, the Drive modes via up, the focus modes via right, and the scene modes via down. The OK button in the middle performs two main tasks - it selects menu options, and also toggles between the three Display modes for the LCD screen. The W80 uses thumb-operated buttons for zooming in and out, a sensible choice given the intended use of the camera. Directly above the navigation pad are the self-explanatory Face Detection, Menu and Playback buttons, and below is the Green mode button. 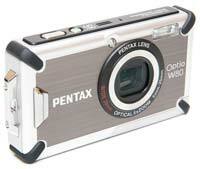 The menu system on the Pentax Optio W80 is perfectly straight-forward to use. A lot of the camera's main settings, such as white balance, exposure compensation and ISO speed, are accessed here. A row of 2 icons along the top of the LCD screen represent the Record and Setting sub-menus, each divided into 3 pages, with most of the options being the kind that you set once and then forget about. Due to the large and bright LCD screen, the various options are easy to access and use, especially as only 6 are shown onscreen at one time. The Green Mode is targeted at beginners, effectively setting all of the camera options apart from the flash, self-timer, focus mode and face priority setting. It's perfect for the less experienced members of the family who literally want to just point the camera and press the shutter button. Accessed via the Mode button, the Pentax Optio W80 also offers Auto Pict, which automatically selects from 8 shooting modes, and a comprehensive range of 23 different scene modes, making this camera particularly well-suited to the beginner. The W80 can record HD quality movies at at 1280x720 pixels and standard quality movies at 640x480 pixels or 320x240 pixels, all at either 30fps or 15fps and recorded in the AVI format. During movie recording, the Optio W80 can prevent unwanted camera shake via the Movie SR option. Unfortunately this is a software based solution that considerably narrows the angle of view compared to normal shooting. The Underwater Movie mode is more useful, automatically optimizing all camera settings for underwater movie shooting. There are some other limitations to the W80's movie mode too. The AVI format choice results in some massive file sizes that quickly fill up your memory cards. The sound quality is not that great, with the usual background noise that accompanies movies shot with cameras that only have mono sound. Even worse, you can't use the optical zoom at all during movie recording (although there is a 6.3x digital zoom setting available). There are no controls on the left or right sides of the W80, except for a chunky strap eyelet. Overall the camera body feels well-designed and not at all cluttered, despite the presence of the 2.5 inch LCD in such a small body, which has a wide viewing angle from left to right, average resolution of 230,000 dots, and is visible in most conditions thanks to its anti-reflective coating. There is no optical viewfinder on this model. The W80 doesn't have a mechanical image stabilisation system, but it does combat camera-shake for still images in two different software-based ways. The Digital SR (Shake Reduction) mode, called Pixel Track SR in the menu, compensates for camera shake by processing affected images with Pentax exclusive software. Although quite effective, the resulting images contain more unwanted artifacts than a lens- or body-based mechanical anti-shake system, and it also slows the image processing time down considerably to over 5 seconds, which will pout most users off from using it. The High-Sensitivity SR mode automatically raises the sensitivity to as high as ISO 6400 to allow for a higher shutter speed. The downsides are the greater levels of noise and reduction in image size to 5 megapixels. You also can't use both modes at the same time. With Face Priority turned on, the W80 automatically recognizes and captures up to 32 faces in just 0.03 seconds. In addition the Smile Capture function automatically releases the shutter when it detects the main subject's smile, and the Blink Detection option warns the photographer if the subject's eyes were closed when the picture was taken. The Digital Wide function is quite effective, creating an extra-wide-angle image that's equivalent to an image taken with a 21mm lens in 35mm format from two images. If you want to to go wider still, the Digital Panorama mode creates a single panoramic picture from up to three images. The new D-Range setting helps to prevent whitewashed over- and under- exposed areas in an image - you can see some examples on the Image Quality page. If you have never used a digital camera before, or you're upgrading from a more basic model, reading the comprehensive but relatively easy-to-follow manual before you start is a good idea. Thankfully Pentax have chosen to supply it in printed format, rather than as a PDF on a CD, so you can also carry it with you for easy reference. The start-up time from turning the Pentax Optio W80 on to being ready to take a photo is quite quick at around 3 seconds, and it takes about the same time to zoom from the widest focal length to the longest. Focusing is quick in good light and the camera happily achieves focus indoors or in low-light situations, and there's also a focus-assist lamp to help out in low-light. With Pixel Track SR turned off, it takes an acceptable 1 second to store an image. If you turn on the Pixel Track SR option, things get a lot slower as noted above. This feature may help to remove camera shake, but it pushes the image processing time to over an unreasonable 4 seconds. In Continuous mode the camera takes just 1.2 frames per second at the highest image quality, which is slow for this class of camera, although the shooting rate is at least maintained until your memory card is full. There is a much faster high-speed continuous shooting mode, providing 2.9fps for up to 8 frames, but the image size is drastically reduced to 5 megapixels and you can only take 8 images before the camera locks-up. Once you have captured a photo, the Pentax Optio W80 has an above average range of options when it comes to playing, reviewing and managing your images. You can instantly scroll through the images that you have taken, view up to 9 thumbnails onscreen at once, and slowly zoom in and out up to 10x magnification. You can view slideshows with different effects and interval settings and set the print order and the transfer order. You can also protect, rotate, resize, crop, and copy an image, plus choose your favourites. A range of 10 digital filters can be applied to a specific image, you can add one of the rather cheesy frames, and red-eye compensation reduces the effects of red-eye. The Image Recovery option recovers images and sound files that have been accidentally deleted, providing you don't turn off the camera. A movie frame can be saved as a still image and movies can be divided. 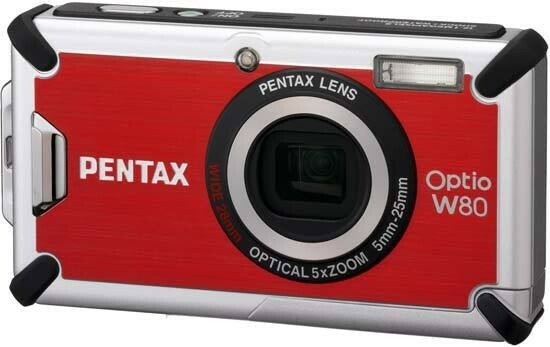 In summary the Pentax Optio W80 is a rugged yet quite stylish point-and-shoot digital camera that should survive most things that your family subject it to.